A teacher-librarian is not simply the guardian of the books, but collaborates with classroom teachers and works with students with inquiry and research topics, evaluating resources, and learning how to create and share their work. 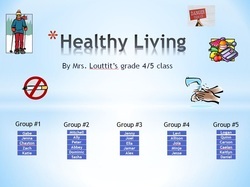 Students researched a number of topics about healthy living in groups. When all the research was completed students chose their two most interesting topics to create a photostory for each and then embed the photostorys into a Thinglink. 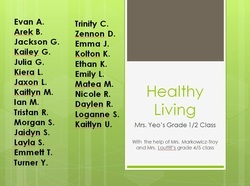 Students began by writing many "I wonder..." questions about healthy living. After watching several audio-video materials about healthy living, they were asked to illustrate what they found most interesting about each. With the help of Mrs. Louttit's grade 4/5 class, the students recorded a photostory, which Mrs. Markowicz-Troy later added to a Thinglink.